Clips on and releases within 3 seconds - no straps required! Ibera panniers can be used as a set or by themselves. With the clever quick release system, Ibera PakRak Bicycle Pannier Bag is your best choice for commuting to work or school! Smart quick release/clip-on system - With the smart quick release/ clip-on system, you can just simply attach and detach bags within few seconds - no straps required! Easy and time saving! Compatible with most carriers - If used with Ibera PakRak Carrier Plus+, other top-mounting PakRak bags can be used simultaneously. For non-Ibera carriers, you can just simply attach the carrier by adjusting bottom hook position. The quick release/ clip-on system works on other carriers too! Stylish design with multiple compartments - Top zippered pocket and 2 large inside pockets hold smaller items with a drawstring pouch for overflowing items. Elastic bands hold down flyaway buckle straps for a streamlined look and stylish design. 2 side pockets, Hand-carry straps and reflective trim that ensures night time visibility. 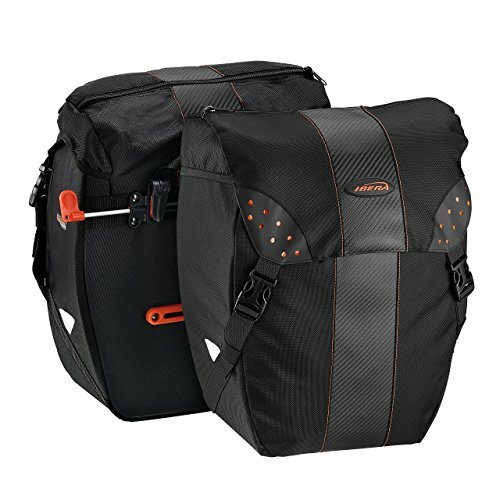 Secure 3-point connection - The design of 3-point interlock can further secure the bike panniers from side swing. Bonus all weather rain cover - All weather rain cover shields items from the elements. Material: Water resistant 1680D Nylon. Dimensions (per bag): 15.7 in x 11.8 in x 5.9 in. Load weight: Carries up to 19.8 lbs (9 kg). Ibera PakRak Carriers Plus+: IB-RA4, IB-RA5 and most third-party touring carriers. Ibera top-mounting PakRak bags: IB-BA1, IB-BA11, IB-BA14, BV-BA1. Smart quick release/clip-on system - With the smart quick release/ clip-on system, you can just simply attach and detach bags within few seconds - no straps required!